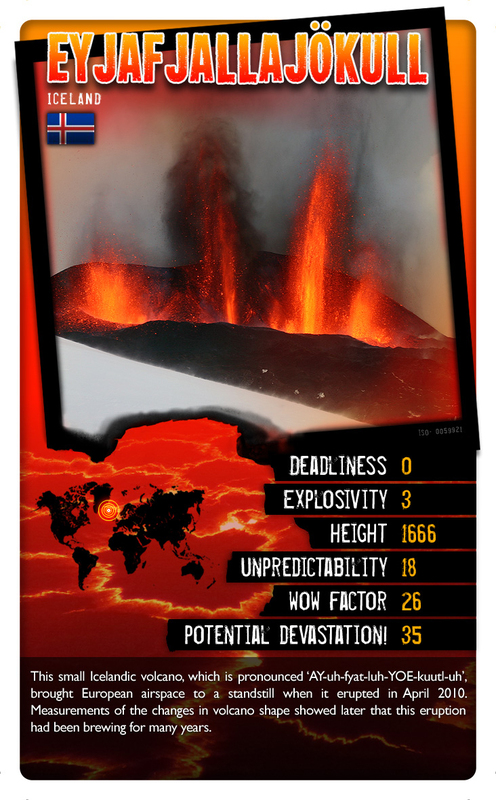 Volcanoes Top Trumps, in partnership with Winning Moves Ltd, official designers of Top Trumps. With the special packs you find on sale here we used start up funds from the University of Plymouth to buy these packs. Any of the profit that we make from selling these packs will go into the Volcanoes Top Trumps Fund; we are doing this in in our spare time and no money made from the cards is going as profit to us or the Universities! A fun, interactive game, where the player is dealt a number of volcanoes, before pitting them against an opponent – choosing a numerical stat about their volcano that they think will win. With official stats, facts and pictures: what better way can you have fun and learn about volcanoes? The game content was devised by volcanologists and geologists affiliated with STREVA (Strengthening Resilience In Volcanic Areas) who devised the game content. They are Jenni Barclay, Anna Hicks, Jon Stone, David Pyle, Paul Cole and Iain Stewart. It sounds great. where can I get one for a xmas present? Would be a wonderful starter for my Year 8’s at the moment. I hope you have 15 in stock? We should do, but they are selling well so get your order in soon! We’ll be really interested to hear how you and your Year 8’s find them! Very disappointed – 4 of the 6 facts are arbitrary numbers. You could have used ‘amount of ejecta’, ‘last known erruption’, ‘distance noise of blast carried’, instead of ‘devastation potential’, ‘unpredictability’, and ‘deadliness’. ‘Wow factor’ could have been a nice summary criteria. Other toptrumps feature far more actual statistics than these. Thanks for your comments! They are not arbitrary numbers. Take a look around this website and you will see we have carefully constructed them from the data available on the volcanoes. These are useful suggestions – but a lot of the categories you suggest are not available for all volcanoes and for many of the cards it would not have been possible to play the game with e.g. last known eruption because it is ongoing or intermittent – or will change. Many of our volcanoes erupt in different ways at different times too.